There are multiple ways of using cannabis aside from smoking and ingesting such as clothing, rope, plastic, paints, paper, and now, cosmetics. These legally produced hemp beauty products are beneficial to your health and skincare, as well as eco-friendly to create. As the legalization of hemp products rise in the market, consider adding some cannabis cosmetics to the daily beauty routine. In recent years, state legislators took steps towards legalizing the farming and production of industrialized hemp. The Agricultural Act of 2014, or the 2014 Farm Bill, allowed universities and state departments to cultivate hemp for research purposes in controlled locations. In 2015, legislators introduced the Industrial Hemp Farming Act which allowed American farmers to cultivate hemp as long as it contained no more than 0.3% tetrahydrocannabinol (THC). This percentage of THC does not produce the ‘high’ of marijuana but still maintains the health benefits of the plant. In 2016, in compliance with U.S. Drug Enforcement Agency (DEA) and U.S. Food and Drug Administration, the Statement of Principles on Industrial Hemp was released to inform the public of the legality of producing hemp within the 2014 Farm Bill. Since then, 30 states passed legislation regarding industrial hemp, and at least 16 states have legalized the production for commercial purposes. The rise in acceptance of hemp products on the federal and state level helps the public accept and normalize the uses of cannabis commercially. Additionally, the legalization shows cannabis has multiple uses and benefits other than the controversial ‘high’ of the drug. Naturally, Of Course, Keep You Out Of Jail. Father And Son Duo Craig And Cody Witt Of Full Circle Soils & Compost, Based In Minden, Began Their Session On Maximizing Soil Fertility With What They Called Compost Yoga. They Instructed Everyone In The Conference Hall To Stand Up, Put Their Hands In The Air And Chant. Among them, were a couple of our very own experts from northern Nevada. Pistil + Stigma’s Rebecca Gasca, who got her degree in international business and economics at the University of Nevada, Reno, talked about cultivating in compliance. ” Compliance is important,” Gasca cautioned during her session. “It’s to keep yourself out of trouble, keep your investors out of trouble, keep your partners out of trouble, keep your colleagues out of trouble. Naturally, of course, keep you out of jail.” Father and son duo Craig and Cody Witt of Full Circle Soils & Compost, based in Minden, began their session on maximizing soil fertility with what they called “compost yoga.” They instructed everyone in the conference hall to stand up, put their hands in the colorado medical marijuana air and chant. “Why did you just do the compost yoga?” Cody Witt, son of Craig, asked the audience. “Soil satisfaction is almost just like yoga. 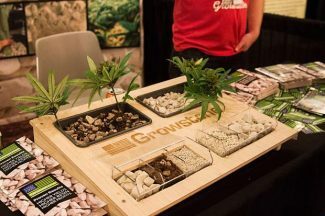 It’s all about the balance, harmony and satisfying all the cravings of your soil and the plants you’re growing in that soil.” Other speakers included Jay Kitchen of UptownGrowLab on the fundamentals of cultivating cannabis. “The plant always seems to come back, treat it with love and respect and you’re good,” Kitchen said during the Q&A portion of his session. Prime Minister Justin Trudeau’s Government Will Introduce Legislation The Week Of April 10 To Legalize Marijuana By July 1, 2018, According To A Report From The Canadian Broadcasting Corporation. Prime marijuana business Minister Justin Trudeau’s government will introduce legislation the week of April 10 to legalize marijuana by July 1, 2018, according to a report from the Canadian Broadcasting Corporation. David Taylor, a spokesman for Justice Minister Jody Wilson-Raybould, declined to comment on the reported timelines. He reiterated a government pledge to unveil a proposed law by spring. VIDEOS TOP JOBS Aurora Cannabis Inc. gained as much as 11 percent, Aphria Inc. rose 6.5 percent, and OrganiGram Holdings Inc. jumped 10 percent. The value of Canada’s pot stocks have soared amid investor optimism that recreational sales, which Canaccord Genunity Group Inc. said in November could reach C$6 billion in sales annually by 2021, may start as early as 2018. Canopy Growth has seen its share price rise more than 300 percent in the past 12 months, while Aurora has climbed more than 400 percent. In December, the Task Force on Cannabis Legalization and Regulation issued a report that recommends the Canadian government regulate the production of marijuana while the provinces control distribution and retail sales. The Approval Has Sparked Fierce Backlash From Cannabis Activists, Who Argue That Insys Has Helped Prevent The Very Kind Of Treatment That It Is Now On Track To Market. Photograph: Bessie Bell On 23 March, less than five months after Arizonas pot measure failed, Insys announced that the DEA had given the green light for the launch of Syndros, colorado marijuana its cannabinoid designed to treat chemotherapy patients struggling with nausea and Aids patients with anorexia. The drug is a lab-made liquid form of tetrahydrocannabinol (THC), a key chemical compound in cannabis. Its different from the street synthetic marijuana known as K2 or Spice , which often involves chemicals sprayed on to plants and has been linked to overdoses and deaths . The approval has sparked fierce backlash from cannabis activists, who argue that Insys has helped prevent the very kind of treatment that it is now on track to market. Its a little bit disgusting when you think of the collateral damage for human beings, said Berman. Whats more, Insys also manufacturers fentanyl, a painkiller that is 50 times stronger than heroin and has a deadly track record . In December, six former Insys executives were arrested for allegedly bribing doctors to prescribe fentanyl to patients who didnt need it. Insyss association with the opiate crisis makes its efforts to thwart regulated marijuana use all the more alarming, critics said. Fentanyl is a drug that is rapidly becoming the major pathway for opioid deaths in the US, said W David Bradford, a University of Georgia professor whose research has shown that medical marijuana lowers prescription drug use. However, Not All Ipos Are Made Equal. With a number of hot IPO rumors – Spotify, anyone – investors are eagerly awaiting the next big gainer . However, not all IPOs are made equal. And sometimes the most anticipated stock market debuts end up being a waste of time and money as reality kicks in (remember Twitter ( TWTR ) and its post-IPO plunge?). In the past couple of weeks, investors have jockeyed to get into two anxiously awaited public offerings … but are these faddish stocks here to stay? Meanwhile, another company has gone private in a more quiet manner but packs a ton of potential for its early-in investors . Reversing the traditional order to get the rotten news out of the way, here are medical marijuana business The Ugly, The Bad, and The Good of 2017’s IPOs so far. First, The Ugly: Snap ( SNAP ) . This social media company, the owner of self-destructing photo app Snapchat, debuted on the New York Stock Exchange on March 1. And straight out of the gate, its stock price soared, gaining a nearly immediate 44%. When Used In This News Release, Words Such As Will, Could, Plan, Estimate, Expect, Intend, May, Potential, Believe, Should, And Similar Expressions, Are Forward-looking Statements. “These products are exciting additions to our recently established CR Brands platform that consists of a broad portfolio of wholly-owned and licensed brands which will be licensed or distributed throughout key North American markets.” About CannaRoyalty CannaRoyalty medical marijuana videos is a fully integrated, active investor and operator in the legal cannabis sector. Our focus is to build and support a diversified portfolio of growth-ready assets in high-value segments of the cannabis sector, including research, consumer brands, devices and intellectual property. Our management team combines a hands-on understanding of the cannabis industry with seasoned financial know-how, assembling a platform of holdings via royalty agreements, equity interests, secured convertible debt and licensing agreements. Forward-Looking Statements Statements in this news release that are forward-looking statements are subject to various risks and uncertainties concerning the specific factors disclosed here and elsewhere in CannaRoyalty’s periodic filings with Canadian securities regulators. When used in this news release, words such as “will, could, plan, estimate, expect, intend, may, potential, believe, should,” and similar expressions, are forward-looking statements. Forward-looking statements may include, without limitation, statements including the Company’s expectations with respect to pursuing new opportunities and its future growth and other statements of fact. Although CannaRoyalty has attempted to identify important factors that could cause actual results, performance or achievements to differ materially from those contained in the forward-looking statements, there can be other factors that cause results, performance or achievements not to be as anticipated, estimated or intended, including, but not limited to: dependence on obtaining regulatory approvals; investing in target companies or projects which have limited or no operating history and are engaged in activities currently considered illegal under US Federal Laws; changes in laws; limited operating history; reliance on management; requirements for additional financing; competition; hindering market growth and state adoption due to inconsistent public opinion and perception of the medical-use and adult-use marijuana industry and; regulatory or political change. There can be no assurance that such information will prove to be accurate or that management’s expectations or estimates of future developments, circumstances or results will materialize. As a result of these risks and uncertainties, the results or events predicted in these forward-looking statements may differ materially from actual results or events. Accordingly, readers should not place undue reliance on forward-looking statements. The forward-looking statements in this news release are made as of the date of this release. Stocks Have Rallied Significantly Since The U.s.
Other data released Tuesday included the S&P CoreLogic Case-Shiller home price index, which showed U.S. home prices rose 5.9 percent to a 31-month high in January. “The more we see the hard data gaining momentum in conjunction with the soft data shows the economy may not stall out in the second quarter,” said Quincy Krosby, market strategist at Prudential Financial. Optimism about some of colorado pot business President Donald Trump’s key proposal’s coming to fruition particularly tax reform, deregulation and government spending has diminished since the administration was dealt a blow on Friday, when a bill aimed at replacing Obamacare was pulled. The bill’s defeat left investors jittery about whether Trump’s pro-growth policies would be able to move forward, sending the three major indexes lower by nearly 1 percent early Monday. The indexes, however, rebounded throughout the day and closed well off session lows. “Like it or not (and we get email in both directions every day), US President Donald Trump represents the latest iteration of the Hero’s Journey when it comes to determining asset prices,” said Nicholas Colas, chief market strategist at Convergex, in a note. “We have essentially traded the typical Fed-Hero of the last few decades for the current President’s economic agenda.” “That is why equity markets were so forgiving [Monday] over Friday’s failure to bring the American Health Care Act to a vote in the House simply put, heroes don’t win every battle,” he said. Stocks have rallied significantly since the U.S. election on hopes Trump’s proposed policies would become reality. Since Nov. The Etf Managers Trust, Which Has Helped Launch Instruments That Invest In Whiskey, Big Data And Cybersecurity Stocks, Filed Paperwork With The Sec To Create The Emerging Agrosphere Etf. That is not to say that all marijuana-related companies are suspect. If you are planning on picking individual cannabis stocks, Brochstein recommended focusing on revenue and avoid companies with “professional penny stock executives.” “All these companies are overvalued. If you try to be Warren Buffett, you won’t buy any of these stocks,” Brochstein said. Many of the marijuana-related companies that investors can buy stock in aren’t “plant-touching.” That means these companies supply goods and services to marijuana growers and distributors, or derive some commercial benefit from cannabis rather than dealing with the actual weed. Good examples of these types of companies are lawn-care products maker Scotts Miracle-Gro , which have been acquiring hydroponics businesses, British biotech company GW Pharmaceuticals , which has a pipeline of cannabis-based drugs, and colorado medical marijuana news real estate investment trust Innovative Industrial Properties , which buys buildings and leases them to growers of medical marijuana. Cannabis funds Meanwhile, investors may soon have access to a U.S. marijuana exchange-traded fund (ETF). The ETF Managers Trust, which has helped launch instruments that invest in whiskey, big data and cybersecurity stocks, filed paperwork with the SEC to create the Emerging AgroSphere ETF. The proposed ETF tracks an index that invests in a group of 69 companies that are involved in the medical marijuana and industrial hemp industries. Only Aphria Was Able To Turn A Profit ($0.03 Per Share) Among The Two, Albeit It’s Valued At More Than 300 Times Its Ebitda! Image source: GW Pharmaceuticals. In two phase 3 trials each for Lennox-Gastaut syndrome and Dravet syndrome, two rare forms of childhood-onset epilepsy, experimental cannabinoid-based drug Epidiolex easily met its primary endpoint of a statistically significant reduction in seizure frequency. Though a cannabinoid-based drug is no guarantee to be approved by the Food and Drug Administration, it’s certainly on the right path to reaching pharmacy shelves. Epidiolex could easily surpass $1 billion in peak annual sales if approved, possibly allowing the company’s aggressive valuation to make sense. The remaining drug developers, including Corbus Pharmaceuticals and AXIM Biotechnologies, are still years away from potential commercialization of their drug colorado medical marijuana pipelines. Additionally, only two of the aforementioned seven largest marijuana stocks — Canopy Growth Corp. and Aphria — have generated positive EBITDA (earnings before interest, taxes, depreciation, and amortization) over the trailing 12 months. Only Aphria was able to turn a profit ($0.03 per share) among the two, albeit it’s valued at more than 300 times its EBITDA! Long story short, cannabis stocks appear to be grossly overvalued on a fundamental basis.